Massive new construction is being erected all along Portland’s North and South waterfronts, as well as the Convention Center Hotel and Vancouver’s new Waterfront project. How will these people get around? Is it time for a Portland Water Taxi? Maybe. Seattle’s Water Taxi proposal for Lake Washington is admittedly more of a tool for developers. Like the Streetcar. Not a bad thing. What criteria should a Portland Water Taxi strive for? A Portland water taxi might only move 500-600 people during rush hour. While a Water Taxi may not reduce congestion in any meaningful way, it still could be a good idea. It’s an attraction that will benefit the Convention Center Hotel and riverfront developments. A 2006 City of Portland study considered Water Taxis as part of the River Renaissance initiative, reports Bike Portland. One key barrier cited back then was the cost of terminals and dock facilities. Since the 1850s steamboats took passengers from Vancouver to Portland. Portland’s Frog Ferry proposes a new Portland Water Taxi and is looking for startup funding as a non-profit organization. The plan has been encouraged by Gov. Kate Brown, Portland Mayor Ted Wheeler and other local leaders. But could Metro and the City Council support it financially? The I-5 bridge carries about 140,000 vehicles daily. Reducing it by 500 vehicles will have NO impact on congestion. Portland is 10.5 River Miles to the Columbia River Confluence (RM 101), plus another 5.5 miles to the Interstate Bridge (RM 106.5) and Vancouver’s Terminal 1. That makes the Water Taxi route about 16 miles from Vancouver to downtown Portland. Compared to driving, it’s twice the distance to Portland, more than twice the cost per mile and a one-way trip takes about 40 minutes. Congestion relief is not the primary argument for a Water Taxi. Frog Ferry says a feasibility study and financial plan would cost $1.3 million. By 2020, that plan could be finished, and boats could be ordered. When completed, three, 150 passenger vessels would provide service. Ferry service could begin by 2022. Any plan may need at least partial federal funding and an operational subsidy of some kind. The boat would be likely be required to go under the Steel Bridge without requiring a lift. That could mean compromises in capacity and design. Still, a low-profile, single level pontoon boat might have room for 10KW of solar on the roof. Electric drive would be quieter and lower operating costs. At $100 per kWatt/hr, a 100 kWatt/hr battery pack (larger than any Tesla) would cost about $10K in 2020. Electric drive would likely save operators between $500-$1000 in fuel everyday. The cost savings over diesel can’t be ignored. ChargePoint has designed a two megawatt, fast charger for electric aircraft and semi trucks. Good for e-boats, too. Top it out in 10 minutes. According to Frog Ferry, their planned vessel would accommodate 149 passengers and connect Vancouver to downtown Portland, likely terminating near the Salmon Springs Fountain. The 38 minute trip would transport people and bicycles but no automobiles. Service could be expanded to Oregon City or up the Columbia. Let’s do some ballpark calculations, excluding the capital cost of the boats and docks which must be amortized ($15M + $25M). Seattle’s Water Taxis burn 125 gallons per hour ($300-$400/hr) at 25 to 30 knots. Let’s assume the total operating cost of a somewhat smaller, slower Portland Water Taxi might be in the $400-$600/hr range with crew. Some Water Taxis estimate their total cost per mile around $2 per passenger. That means a 15 mile, 40 minute commute might cost around $30 per person with a minimum of 20 people — just to break even. If that figure is anywhere close, it would be too expensive…and too slow…for daily commuters. Subsidies and grants will almost certainly be required. Perhaps electric or hybrid-electric drive could reduce costs and innovative hull designs could reduce the wake at their 22 knot estimated speed. Pittsburgh envisions a fleet of six to ten 8-10 passenger boats, similar to those found in Victoria and Vancouver, BC. Would that be an option? Seattle’s Water Taxi proposal would utilize 90-foot catamaran boats holding 149 passengers in the first floor hull, with room for bikes. Seco’s proposed Water Taxi is structured as a real estate promotional tool. They are working with All American Marine in Bellingham and its partner Teknicraft Design to design and manufacture the boats. Seattle’s real estate partnership reduces the political risk. It won’t solve congestion issues, but so what. It could still make sense for the region. San Francisco’s Water Emergency Transportation Authority (WETA) carries over 2.8 million passengers annually utilizing a fleet of 14 high speed passenger-only ferry vessels. Over the last five years, SF Bay Ferry ridership has grown 85% percent with wait times of 15 minutes or less during peak commute hours. Their 20-year strategic plan calls for operating at 16 terminals with 44 vessels by 2035. The impact on waterfront development could be significant. Here are some major waterfront developments in the Portland/Vancouver region that could benefit. For decades, the 33 acres at the western base of the Ross Island Bridge harbored Zidell’s barge business. But on June 16, 2016, the family launched its last barge, clearing the way for a massive development in Portland’s South Waterfront neighborhood. Their sweeping proposal calls for 2,200 residential units, 1.5 million square feet of office space, a grocery store, a retail anchor, restaurants, parking, a 200-room hotel, three parks, a public plaza and a waterfront greenway that includes recreational access to the Willamette River. Initial construction is slated to start in fall 2018. They expect to open the first buildings two years later. With much of the Pearl District built out, developers are looking to the northwest. What was once (and in some cases still is) a gritty stretch at the base of the Fremont Bridge is undergoing a spate of new development. Waterfront development plans for the Olympic Mills and Terminal 2 are on drawing boards. Two six-story buildings were completed in March. A 14-story residential tower is taking shape down the block from a New Seasons Market. Cairn Pacific continues work on the Slabtown blocks, where Con-Way once operated its freight business. The Portland Diamond Project and the Port of Portland plan to develop a stadium on Terminal 2, a 50-acre parcel of industrial land along the Willamette River about one mile north of the Fremont Bridge. It’s served by just one infrequent TriMet bus line (16) and it’s over a mile away from a Portland Streetcar stop. Even with the Streetcar’s planned northwest expansion a stop would still be about a half-mile away. Nearly three decades after the Convention Center opened, it’s finally getting a hotel. The 600-room Hyatt Regency in Northeast Portland broke ground Aug. 4, 2017 and is expected to open in 2019. This $1.5 billion mixed-use development will transform and usher in the next chapter for the entire metropolitan Vancouver/Portland area. At full build-out, the master plan proposes 3,300 new residential units, over 1.25 million square feet of Class A creative office space, a boutique hotel, flagship restaurants, and unique retail spaces. PHASE 1 includes 40,000 square feet of restaurant space – Grant Street Pier, 5-6 signature restaurants, 45,000 square feet of ground floor retail, and approximately 270 apartment units – (Blocks 6 and 8), 138 room Hotel Indigo and 40 condominiums – (Block 4). How do you get from the Ferry Dock to where you want to go? There’s an app for that. Seattle’s Lime Scooter rentals will shortly be expanded to cars. You can rent a car for about $12/hr and leave it most anywhere (within city limits). Washington Gov. Jay Inslee says the future of transportation will be in Seattle. The state, which has the country’s largest ferry system, set aside $600,000 in its 2018 state transportation budget to research how to convert ferries from diesel to hybrid electric propulsion. Three ferries are being proposed for conversion to hybrid electric propulsion, the Tacoma, Wenatchee and Puyallup, which serve the Seattle-Bainbridge and Edmonds-Kingston runs, with 202 vehicle and 1,500 passenger capacity each. Guess who’s the pioneer in hybrid electric tugboats … Oregon’s Foss Maritime in Rainier. Foss tugs use a combination of batteries, generators and main engines … much like a Prius. Foss built the first hybrid/electric tug, the Carolyn Dorothy, and followed up with the Campbell Foss tug in 2012. The clients were the ports of Long Beach and Los Angeles, California. Their major motivation was to reduce carbon emissions, but the electric motors are quieter and use less diesel. A Pure Electric Outboard motor and one battery pack starts at $14,500, but a typical 16-foot aluminum fishing boat equipped with two battery packs (the equivalent of 40 hp) could only go about an hour at 25 MPH, not a practical Water Taxi solution yet. But with gas almost half the operating cost, perhaps bigger batteries and faster chargers will change the equation. It’s not there yet. A Virginia Beach Water Taxi study planned for a (one-way) trip distance of 8.5 nautical miles (nm) that takes about 45 minutes. A 26-foot long pontoon vessel would allow for up to 12 passengers and crew. It could accommodate a wheelchair and carry a couple of bicycles. A pontoon boat, a trailer, and a storage canopy would cost about $35,000. If there are more than six paying passengers the operator must have a Masters Captain License and the vessel is subject to Coast Guard inspection. The Virginia Water Taxi proposal estimates an average of 25 passengers per day. The 8.5 mile round-trip fee required for break-even operations at 25 passengers daily for each of the 150 days of the season is about $29 per passenger. Expenses include labor, fuel, maintenance, depreciation, advertising, supplies, and profit. The operations cost is approximately $109,000 for the season or about $715 per day of operation. Could Portland’s proposed Frog Ferry deliver a break even cost of $2 per passenger mile? Unknown. Probably not. Public subsidy of public transit is one thing. An Oregon subsidy for Vancouver commuters on a Water Taxi that would have NO measurable impact on congestion would be a much harder sell. Luxembourg, with a population of about 560,000, has become the First Country to Offer Free Mass Transit for All. Luxembourg budgeted nearly €900 million for mass transit, but recovered only €30 million in ticket sales. Saving the overhead of collecting fares helped pay for the cost of free travel. Public transit may cost an average of $7.83 per passenger who will give back only $1.26 in fares. Everything else is subsidy. A “farebox recovery ratio” can average 15%-30%, but the cost of collecting those revenues can cost almost as much. 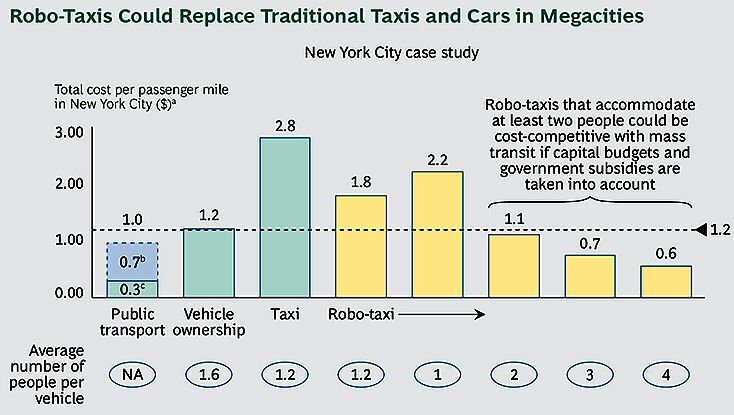 While more passengers mean more expense, cheaper autonomous transit may be moving towards free. Elon Musk says he can build a tunnel for $10 million per mile. A ten mile tunnel from Vancouver to Portland might cost $100M. Using private capital and no subsidy. Musk plans to charge $1 per passenger or $4 per car on the 8 mile Chicago Loop. Ten miles for $1 is 10 cents/mile. Game changer. A hyperloop in a tunnel may be cheaper, faster and more convenient than any option. No subsidy. Or keep the current transit subsidy and give everyone a buck for riding the “loop”. NASA and the FAA aim to work with private-sector participants to set regulatory and technical standards for sky taxis that can bypass traffic congestion, flying passengers between urban hubs. Uber will roll out their Sky Taxis in Los Angeles, Dallas and Dubai as early as 2020. But Airbus predicts costs of Sky Taxis will decrease quickly. Similarly, some predict the cost of urban electric trucks will reach cost parity with diesel counterparts by as early as 2025. Vancouver could be THE regional transportation hub. The Port of Vancouver is ideally positioned for an Air Taxi hub. Easy access to freeways and trains. Quick jump to the airport, UPS and Portland. Electric powered E-VTOLs made by Uber, Airbus and Boeing are fast, quiet, and don’t need a pilot. Airbus is testing pilotless air taxis in Pendleton right now. Congestion costs Portland commuters $1.76 billion in time and fuel in 2014, according to a 2015 analysis by the Transportation Institute at Texas A&M University. Gas for a car costs about $.12 per mile while electricity costs about $.04 per mile. But Water Taxis won’t impact traffic congestion, making that argument largely irrelevant. It’s a real estate development tool, like streetcars. A hybridized water taxi might be just the ticket for developers but would likely require subsidies. It would have NO impact on congestion. The Interstate Bridge carries about 140,000 vehicles daily. The Water Taxi aims to reduce it by 500 vehicles. Perhaps innovative designs like the Sea Bubble, using electric drive, hydrofoils and even autonomous piloting will prove to be faster and cheaper. Or perhaps not. Sky Taxi advocates claim they will be able to provide faster service at lower cost in less than 10 years. Really? Could an AirBus Sky Taxi and Sea Bubble Water Taxi be the solution? Shared electric transport, water taxis and sky taxis may be part of a congestion fix. Are they a better solution than a new Interstate Bridge or a wider freeway? Maybe. But tunnels carrying “free” autonomous electric transit may provide a faster, cheaper, more convenient option in 5-10 years.